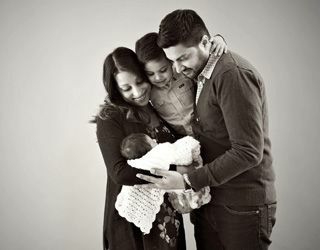 When Omar and Natasha Rajani got married in 2010, they had no idea that their journey to have kids would be such a bumpy road. The couple tried to get pregnant for over four years, trying nearly every available measure in an attempt to conceive. From simple cycle monitoring, fertility drugs and intrauterine insemination to a terminated ectopic pregnancy and failed IVF, it was a never-ending up and down of stress, nerves and tears. Natasha’s age, the failed IVF and other challenges they were having made them eligible for a trial treatment, only available at one clinic in North America that happened to be in Toronto. Called Augment IVF, the treatment re-energizes a woman’s eggs using mitochondria from her own egg precursor cells. In the trial treatment, which has not been approved by the FDA in the United States, mitochondria – seen as the “batteries” that energize the cells – are injected into an egg, along with sperm, during IVF. The couple froze four embryos and implanted two. Nine months later, on April 13, 2015, Zain Rajani entered the world. He made international headlines, becoming the first baby in the world to be born via Augment IVF. After all the stress of getting pregnant the first time, the Rajanis were hopeful to add another child to their family, with Omar actively encouraging Natasha to have a second baby. Natasha, however, was a little more hesitant. The embryos are graded and the best two were transferred with Zain. So neither Natasha nor Omar thought it was going to work with the remaining two. On January 19, 2018, Malai Rajani was born, making her the second Augment IVF miracle baby for the family. And no one is happier for Omar and Natasha than Omar’s close friend, Aaron Thompson ’95, who supported his friend through their fertility issues for years. Now, the Rajanis are adjusting to a new set of challenges. Meanwhile, Omar is trying to get used to a fuller house, more responsibilities and not having much time to relax anymore, while Zain has to adapt to not being an only child. Still, the couple wouldn’t have it any other way. Throughout their whole ordeal, they both remained positive, hopeful and supportive of each other. That was the message Omar and Natasha wanted to bring when they agreed to all of the media coverage when Zain was born. “Natasha’s message was really one of hope. There are tons of people out there with fertility issues, yet it’s a taboo subject that people don’t talk about.